Published on June 7, 2017 in Court, General T&T, Law, Media, Politics and UNC. 2 Comments Tags: Anthony Carmona, Devant Maharaj, Newsday, Politics. NOTHING stands in the way of President Anthony Carmona swearing in two new judges to the High Court. In a unanimous decision yesterday, Justices of Appeal Allan Mendonca, Nolan Bereaux and Peter Rajkumar said they were satisfied the Judicial and Legal Services Commission (JLSC) was properly constituted. They also threw out a substantive claim of former United National Congress Senator Devant Maharaj who challenged the constitutionality of the JLSC’s composition, on the basis that the Constitution does not permit more than one retired judge to sit in the commission. 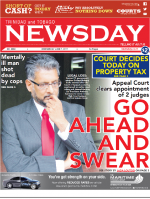 Published on June 7, 2017 in Court, General T&T, Law, Media, PNM, Politics, Property Tax and UNC. 5 Comments Tags: Anand Ramlogan, Express, Justice Frank Seepersad, Kamla Persad-Bissessar, Politics, Property Tax, T&T Govt. THE Court of Appeal has overturned another ruling of Justice Frank Seepersad, this one involving whether the State could continue to accept Property Tax valuation forms from citizens. This morning, the Appeal Court ruled that Seepersad should not have granted an interim stay on the collection process but that the substantive matter for judicial review is still on.